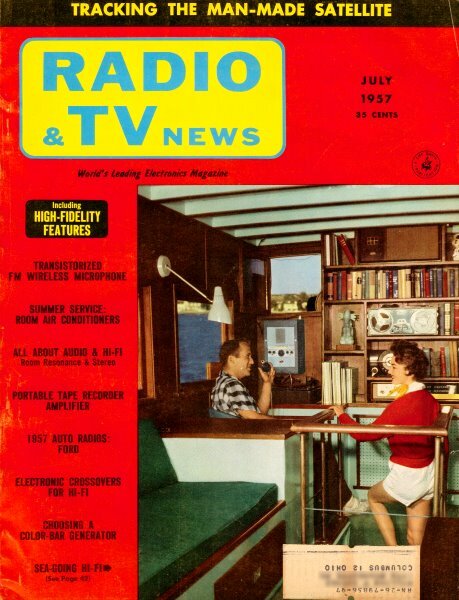 1957 was part of the hey day of the newfound radio-in-your-car craze, and the public was voraciously consuming all the high tech equipment it could afford. Rock and Roll music was on every teenager's mind and many guys for the first time were able to have their own wheels and were outfitting them with sound systems that could blast the latest works of Buddy Holley, Chuck Berry, Elvis Presley, and Fats Domino. Those machines were the first babe magnets used for cruising the strip on Saturday nights. Radio stations were popping up all over the country, enabling cross-country travel with non-stop music, news, and variety show entertainment. 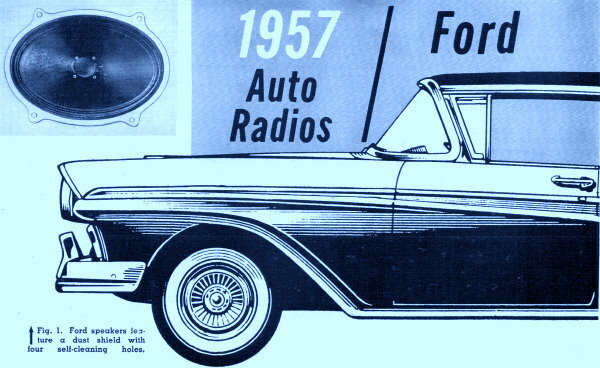 Ford and Chevrolet were not going to miss an opportunity, so they delved into the high end mobile radio manufacturing business. 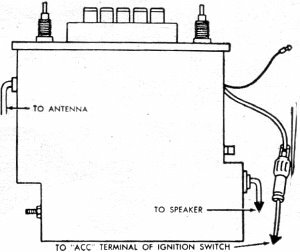 As the quality of broadcasts increased, noise cause by automobile ignition systems bubbled to the top of issues affecting listing pleasure, including the distance over which a broadcast could be received. This article describes Ford's efforts to please their customers' demands. Here is the equivalent report for 1957 Chevrolet radios. Fig. 1. Ford speakers feature a dust shield with four self-cleaning holes. A systematic check can pinpoint many faults without chassis removal. Dismantling itself is no problem. If readers of our other presentations on this year's car receivers have retained any doubts as to the established position of transistors, low-voltage miniature tubes, and printed circuits in this field, the three basic radios used in the 1957 Fords do nothing to encourage such hesitation. All three models follow the noted trends. Some innovation also appears in the speakers used. Continued reliable performance from these components is assured by the use of a sealed magnetic structure and incorporation of dirt-release holes. The four release holes can be seen near the apex of the cone in Fig. 1. Vibration of the speaker in ordinary use propels foreign particles out of these openings, but the valve-like action provided by the small size of the openings impedes the return of dirt and dust. One of the receivers available for all Ford cars except the "Thunderbird" is the 75MF. This push-button hybrid includes among its five tubes a 12BL6 r.f. amplifier, a 12AD6 converter, a 12AF6 i.f. amplifier, a 12AJ6 detector - 1st audio stage, and a 12K5 audio driver. A 2N176 audio output transistor is mounted on a heat sink at one side of the chassis. Another five-tube unit also using low-voltage tubes in a hybrid design is the 75BF. It uses a 12AF6 as the r.f. amplifier, but otherwise follows tube line-up of the 75MF up to the 1st i.f. stage. This is followed by a 2nd i.f, amplifier (12CN5), which feeds a 12J8 detector-1st audio tube. The usual audio driver for the transistor is here omitted, with the 12J8 directly feeding the 2N176. For those who like their auto radios with plus features, Model 78MF provides search tuning and push-pull transistor output, supported with eight low-voltage tubes. Two 12AD6's are used as the r.f. amplifier and converter. The two-stage i.f. strip employs a pair of 12AF6's; and the detector-1st audio portion is handled by a 12AJ6. The conventional 12K5 audio driver feeds the push-pull 2N176 pair of transistors. The trigger amplifier for the search tuner, a 12AE6, feeds the 12K5 control tube, which operates the relay. Fig. 2. Location of leads to receiver. Fig. 3. The receiver and the dashboard. Fig. 4. Details for installing or checking noise suppression equipment. See text. As with most auto radios, a defective receiver, once it has been determined that the fault is in the circuit itself, can be handled on the service bench with no more difficulty than is experienced with any other radio. Two problems must be faced first, however. The first of these involves prior determination of whether the symptom under examination is actually traceable to the receiver. Then, if it is indeed found to be in the circuit, the business of getting the chassis out of its secure position behind the dash panel (and subsequently that of returning it in satisfactory fashion) must be faced. To attack the problem systematically, a kit of parts for troubleshooting is recommended. These include spare 5- and 7.5-ampere fuses, one each of every tube type used in the receivers, a spare speaker, a spare antenna with lead, and a set of suppression equipment. All parts except fuses should be pre-tested and marked so that they will not be left in the radio inadvertently during substitution tests. Thus armed, the technician is ready to localize symptoms with the receiver still mounted. No reception: The fuse is checked first. If it is blown, a new one is tried. If this also blows, the next step is removal to the bench. If it does not blow, check to. see whether the tubes are lit. If they are not, the availability of voltage at the A lead (see Fig. 3) should be checked with a meter. If tubes are lit, the substitute antenna should be tried to see whether the trouble can be isolated to this section. Similarly, the substitute speaker can be tried. To avoid damage to the transistor, never operate the radio without a speaker. If none of the measures noted localizes the trouble, step-by-step substitution for each tube is the final test before removal to the bench becomes mandatory. Check of the output transistor(s) should not be attempted with the radio in the vehicle. This component is not considered a likely source of trouble in any case. Noisy or erratic reception: To iso­late, it is important to know when the noise occurs. If it is present when the engine is not running, the defect is probably in the receiver. However, all leads to and from the chassis (Figs. 2 and 3) should be checked first for secure connections. If noise is present only when the engine is running, and even when the vehicle is not in motion, check the suppression equipment. More detailed reference will be made to this equipment later in connection with Fig. 4. Also make sure that the receiver is properly grounded both to its support bracket and to the contact with the instrument panel. Noise that occurs only when the auto is in motion may be due to intermittent contact to automobile ground, through either the support bracket or the instrument panel. However, also keep in mind the fact that, if there is intermittent contact with the antenna or another part of the antenna system, similar indications will result. These other possibilities should also be checked when the noted symptoms are present. Distorted or garbled sound: Before dismantling the radio, it is a good idea to check the speaker and individual tubes by substitution. Sometimes, if the speaker is improperly mounted, bending or twisting may throw the voice coil out of alignment. Mounting nuts should be tightened by hand only. If wrench or pliers are used for this operation, there may be a tendency to over-tighten, with poor sound resulting. Some cases of weak reception can also be corrected without chassis removal. 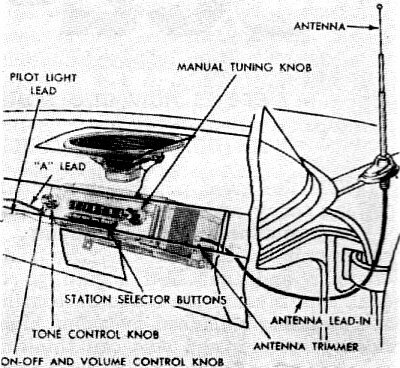 The antenna trimmer, which is accessible externally (Fig. 3), may be misaligned. It should be adjusted with the antenna fully extended. When the search tuner tends to run continuously without stopping on certain stations, it is well to remember, the actual trouble may also be poor sensitivity. In this connection, note that poor sensitivity and the other symptoms that may result from it can be evident when the auto's battery voltage is low. A check of battery voltage may often save the job of dismounting the radio for a bench check. Suppression equipment: When it becomes necessary to check or install suppression equipment, make certain that all paint and dirt are removed from between capacitors and the vehicle and that all nuts and bolts are tight. The lead shown as Item A in Fig. 4 is the high-voltage distributor-to-coil wire. The generator suppressor capacitor is shown as Item B. To remove or install it, it is not necessary to remove the bolt. The latter need only be loosened enough to slide the mounting bracket under the lock washer. 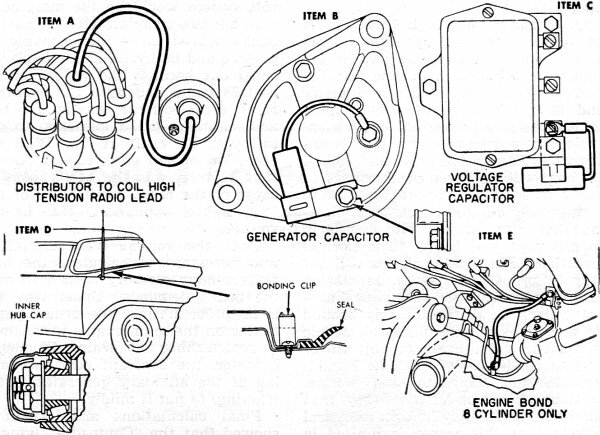 The capacitor for the voltage regulator is shown at G, and the bonding clip is located as shown in Item D.
To get at the static collectors, the front hub grease caps, as shown, must be removed. Make sure that the cotter key is bent away from the spindle center hole so that it will not interfere with the static collector. The bonding cable - this applies to 8-cylinder models only - is shown in heavy outline in Item E.
Physical considerations: When tube substitution is necessary, access is obtained simply by removing the bottom cover of the receiver. This should present no problem. The tubes may then be found, protruding downward from the chassis plate and within convenient reach. When the receiver itself has to be taken out, the most advantageous position to assume for this chore is in the center of the front seat, directly in front of the receiver dial. Be sure that the ignition switch is off. As a preliminary step, the air-duct assembly on the right hand should be removed to get it out of the way. The three leads connecting to the radio - the antenna lead, the A lead, and the pilot-light lead - should now be disconnected, and the fuse withdrawn from its holder. Next remove the control knobs, bezel-mounting nuts, bezel, and the panel-mounting nuts. The leads are shown in Figs. 2 and 3. The hardware should present no problems. The lockwasher on the stud at the right side of the chassis is then removed, and the mounting bracket is pushed away from the stud. Now the bolt from the other bracket, at the lower left of the chassis, is also removed. Now the receiver is free of its mounting, but must still be maneuvered out of the space in which it is located and into the clear. To complete removal, grasp the chassis with both hands, push it forward, and tilt it toward the toe-board until it clears the instrument panel. This completes the job. To get the receiver back into position, the dismantling procedure is reversed with very little change. The entire unit is guided into position with both hands but, once it is oriented, it is steadied in place with one hand while the other is used to install the panel-mounting nuts finger-tight only. While it is thus held, slide the right-hand mounting bracket over the stud at the right side of the chassis, and install the nut and lock washer here. Be sure that all cables and wires are clear of the chassis, else you may have to perform partial dismantling again when you find that leads cannot be connected properly because they have to become caught. Now you can install bolt and lock washer to the stud on the left side. Getting the bezel and the hardware in place is a relatively simple matter. Next the speaker plug, A lead, antenna lead, and fuse are returned to place. Be sure that they are securely connected. Last, don't commit the common oversight of forgetting to put the air-duct in place.